Even if the recap page hadn't clued you in, there would have to be no question that this month's Iron Man: Director of SHIELD is the concluding chapter of the story arc. When a cluster of nuclear weapons aboard the SHIELD helicarrier are remotely ordered to detonate in less than three minutes' time, that doesn't leave a whole lot of wiggle room. It's either the end of the threat, the end of the world or some screwed up, time traveling, slow motion-dependent garbage. My money is on the first. Stuart Moore's nuclear-themed drama has provided some compelling reading while also posing some unsettling real world questions. The notion of a military device devised to usurp control of the entire world's nuclear arsenal isn't that far-fetched an idea, and the very thought of it falling into the wrong hands is a legitimately pant-wetting proposition. Where the concept loses a bit of steam is in its execution. Sure, I can imagine a couple hundred Pentagon employees coming together to try to build something like this in the real world. What I have a little trouble imagining is the thing taking the form of a purple, building-sized floating brain with flashing lights and an automated self-defense system. But I suppose such peculiarities are to be expected considering the medium… ditto for the Tetsuo-like tendrils that hook the brain's pilot to its control system. Beneath the cartoony excesses, this really is a sharp, smart storyline. It's not quite as grandiose and world shaping as the premise would lead you to believe, but at its core it's still a fine example of a brand of storytelling that's a perfect fit for Iron Man's unique characteristics. 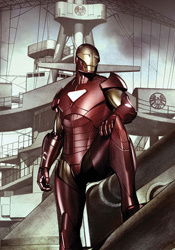 Stark gets equal opportunities to shine mentally as he does physically, and his dialog is layman-friendly. It's far from uncommon for one of Marvel's mightiest to lose his readers when he uses brainpower to solve a complicated problem (Mr. Fantastic and Dr. Strange have been doing it to me for years), but that's a trap that Stuart Moore avoids this month with Tony Stark. Dueling artists Carlo Pagulayan and Steve Kurth don't prove to be much of a match for one another this month, although neither left me particularly impressed. Pagulayan's work is the better of the two, showing the influence of Frank Quitely in the care and precision he grants to the page if not the overall composition and pacing. His characters have real depth and personality, although they don't always look comfortable on the page. When the narration switches gears and Kurth takes over, the issue loses a lot of momentum. Pagulayan's artwork wasn't perfect, but compared to Kurth's awkward, ugly illustrations he's a saint. Kurth is given more chances to visually surprise us, as the story twists and turns much more frequently in the issue's second half, but his work is so stiff and clunky that they provide little more than blown opportunities. With a regular artist, I think Stuart Moore could be making some real progress with Iron Man. He's found a nice blend of action, adventure, technology and espionage here, based it in a world that's a little bit too familiar and given it a slightly outrageous slant to keep his readers entrenched in the storytelling and not in its parallels in the real world. With a regular rotation of artists, he's never had a chance to really dig in his heels and make a mark, and sadly, that's a trend that continues this month. Flip through it but don't pay it any serious mind until Marvel can lock down a better illustrator.